With our Hull Hog Roasts Caterers we provide the very best Hog Roast catering, pulled pork and BBQ catering food available in the Hull area. Our Hog Roast Catering team is second-to-none and have won awards nationally and throughout Yorkshire. We serve Hull and the East Riding of Yorkshire for both indoor and outdoor catering whether it is Wedding Catering, Birthdays or a business event. No event is too big or too small for a good Hog Roast! We only use the very best free range ethically sourced local meat and fresh produce, and everything is prepared by hand with love and care by our Hull Hog Roast catering team. Our trained Hull Hog Roast Caterers have many years of experience, serving at catering events right across Hull and throughout Yorkshire. We know that using the very best local ingredients will allows give the very best flavours and produce a great Hog Roast that is succulent and has that extra "wow-factor". Our chefs prefer to always work this way, making every Hog Roast catering event truly memorable. Hull Hog Roast Catering is provided with the highest quality meat from livestock that have been really well looked after. Although we only use produce from the Hull and Yorkshire area for our Hog Roast and BBQ catering - this hasn't stopped us from winning awards which help give us one of the very best catering reputations for BBQ food in the whole of Britain. If you're planning an event and hoping to please everyone, then why not hire a Hull Hog Roast - it's the very best way to feed a crowd with wholesome and mouthwatering food that everyone can enjoy, and best yet it isn't expensive. The Hull Hog Roast caterers team have served at hundreds of events over the years, so are the ideal caterers to advise and take initiative. We know what it takes to serve the very best Hog Roast possible. And what a spectacle for hungry onlookers! The crowd will gather as the meat crackles and the juices, flavours and aromas entice your guests by the BBQ fire. We serve up your Hog Roast meat into a simple bread roll or bap with delicious fillings, loaded with fresh herbs, spices and homemade sauces for the ultimate flavours. 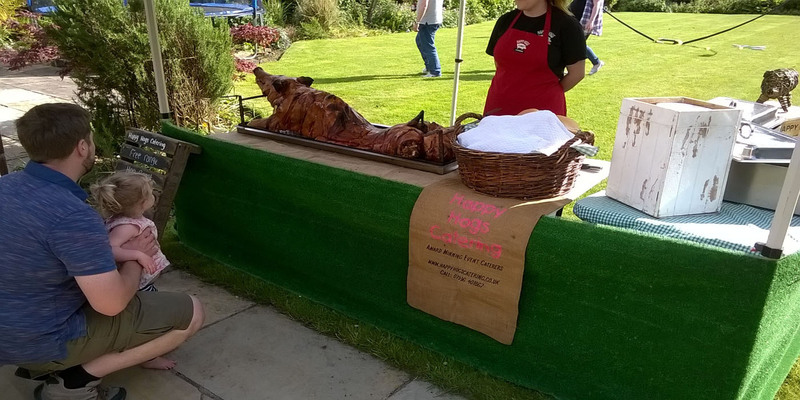 Outside event Hog Roast catering in Hull is on the up, gaining steady popularity with family parties, events, weddings and business opting for Hog Roast and BBQ food that can really satisfy in both a formal or casual setting. We believe this surge in Hull Hog Roast popularity is in part down to Hull's history and background, making a rustic and wholesome catering style fit well with Hull's handsome scenery. Businesses in Hull are also now hiring Hog Roasts for corporate events, away days, parties and open days or product launches. The Hog Roast is friendly and inviting to all, and just smells so tempting! For Wedding catering the Hog Roast is just ideal, guests can stand or sit while eating and they'll never leave hungry. A Hull Hog Roast can also be hired for your Christening, or even festive seasonal parties at Halloween, Bonfire Night, Christmas or for New Year. Any time of the year, our dedicated and professional catering team will serve at your special occasion or event. Hull Hog Roast caterers serve over 150 weddings now every year. We provide everything you will need for your Wedding Catering service, including professional chefs, serving team and even a mobile kitchen! At every single Hog Roast Wedding we've catered, there has always been a fantastic reaction from the hosts, guests and family members. A Wedding Hog Roast in Hull gives you the opportunity to make your Wedding even more memorable. We only use the very finest free range produce for our barbecues and Hog Roasts which are always cooked to taste perfection. We'll also cater to your exact requirements, creating bespoke menu options or fitting our dishes and catering style to match your theme or type of occasion. If you wish to discuss our Hull Hog Roast Wedding Catering packages please contact us and we'll be glad to help. Why Choose Hog Roast Catering in Hull? Choose Hog Roast catering in Hull for your event, wedding catering or party and let us go beyond your catering expectations with amazing food, great service and a friendly atmosphere. It may sound a strange option to hire Hog Roast catering, but it is not as unusual as you may think! The Hog Roast is always ideal because it can be served anywhere due to being a mobile catering option. Your guests also get to eat the most delicious BBQ flavoured food whether they are standing, walking, sitting or formally dining. The other advantage is that a good Hog Roast always tastes incredible, with gorgeous smoked tender lean meat which can be eaten both inside or outdoors. With all these catering advantages it is no wonder why the Hog Roast is more popular than ever. If you hire a Hog Roast for your Hull event catering we know that your guests will always remember your special occasion and will enjoy some of the best food they've ever tasted. Hull Hog Roast Catering are pleased to have now won ‘The North of England’s Wedding Awards’ in the caterers category, going up against Exclusive Caterers Dine from Sarah Beeny’s wedding venue Rise Hall and Michelin star dining from Box Tree Catering previously owned by James Martin celebrity TV chef and many other event caterers, wedding caterers and Yorkshire caterers.